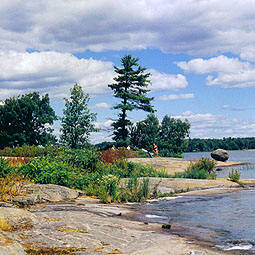 Georgian Bay, Ontario is considered by many to be one of the most beautiful places in North America. Considered to be the 6th Great Lake, the Georgian Bay area has over 30,000 islands with over two thousand kilometers of shore. Hiking, fishing, sailing, caving, shopping, or going to the theatre are all on the agenda when you visit the Georgian Bay area. Towering cliffs, clear waters, and pine trees abound as you get to commune with nature at its most unspoiled state in Canada. Transportation is up to you. If you prefer to travel by sailboat, kayak, bicycle, motorcycle, or car, you can find each mode being utilized in the area. Visit the lighthouses along the coastline, beach hop and comb for treasure, or try your luck for one of the many different types of sport fish found along the many waterways Georgian Bay has to offer. Walleye, pike, and smallmouth bass are just a few of the species that can find their way onto the menu, if you can manage to catch them. Fishing is a very popular activity and you can fish independently, or choose one of the many successful guide services in the area. Tour the area in a glass bottom boat, hike 15 meters up in the trees, tour the many waterfalls, explore caves, or sail in the North Channel, a world famous sailing area. Hike along Canada’s oldest and longest footpath, the Bruce Trail, that will take you through a Biosphere Reserve and give you some of the best views that there are of Georgian Bay. Georgian Bay Township is a municipality in the Muskoka District, in south central Ontario, Canada. 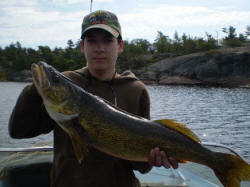 Found on the Severn River where it empties into Georgian Bay, the fishing at this confluence is deservedly famous. Honey Harbour serves as a jumping off point to access one of the many different beautiful cottages found scattered amongst the 30,000 islands that are found throughout Georgian Bay. In Honey Harbour, you can find the necessities at the grocery, post office, bakery, Church, or liquor store. Discovery Harbour is found on scenic Penetanguishene Bay and is a step back in time. The village is a recreation dedicated to the 19th century period when the British Navy and Military were a fixture in Central Ontario. With replica British Sailing Ships and historic properties, there is living history to experience. Georgian Bay is the perfect family holiday with something to do for everyone. You can spend your time seeing history, exploring the wilderness, or communing with nature up close and personal on the water fishing, sailing, or kayaking. With literally thousands of cottages strewn about the many hamlets in the region, you can find your dream vacation spot, and start planning what you will do not only this year, but what you are going to have left to see and do the next time to come back to visit Georgian Bay.